One of the things that can make or break a vacation when traveling with pets is the accommodation. Not all “pet-friendly lodging” is created equally, so at PetsWelcome we thought we’d start highlighting properties that take being pet-friendly very seriously. If you own or know of a property – a hotel, vacation rental, B&B, etc. – that should be profiled here, let us know! Today, we’re learning more about Sandbridge Beach Vacation Rentals from Lisa Roland, who is the Sandbridge Realty marketing director. Tell us about your property. Where is it located? What’s nearby to do/see? What time of year is best for a visit? 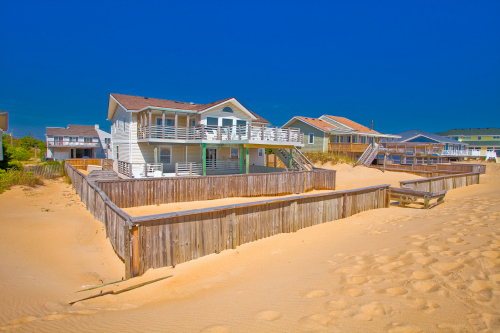 Our beach vacation rentals are located in Sandbridge, in the southern part of Virginia Beach. Many of our guests that bring their pets take them to the beach for long walks in the morning and also in the late afternoon. The best time of the year to bring a dog to Virginia Beach would be in the spring and early summer, and then again in the fall. Basically before Memorial Day and after Labor Day. There are some rules and regulations that the city posts for bringing your dog to the beach, such as leash lawas and time you can walk your dog. In the off-seasons, the regulations are less stringent. The other advantage is the weather is more pleasant for a dog, as high summer temperatures are not well tolerated by many breeds. You can take your dog to one of many close city parks, there is a dog park, and you can take your pet to the resort area of Virginia Beach and stroll along the boardwalk. What makes your property pet-friendly? What else about your location makes this a great place to vacation with a pet? Currently Sandbridge Realty offers over forty homes that are “pet-friendly.” Some of our pet-friendly homes offer either fenced-in yards or deck areas with gates. Sandbridge Realty also gives your dog a little gift upon checkin – we want your furry friend to have a great vacation, too! 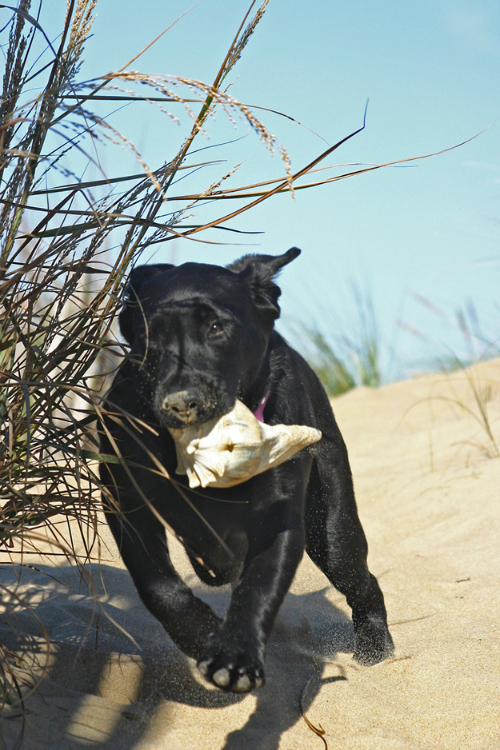 Many many of our guests send us photos of their vacation with their dog playing in the sand. We love to see the smiles and wagging tails! What else about your location makes this a great place to vacation with a pet? One of the nicest features of Sandbridge is the lack of big businesses and traffic. It is the perfect vacation destination to truly relax with all of your family members! The two main streets are low speed zones, too, which makes for a pleasant walking or jogging experience for you and your dog. Virginia Beach is a resort city on the Chesapeake Bay. It’s on the southern part of the Virginia coast, right on the border with North Carolina. This is no sleepy beach town – Virginia Beach is actually Virginia’s most populous city – but it remains a popular draw for visitors seeking great beaches, a year-round temperate climate, and easy access to everything one needs on vacation. The beach is obviously the main draw, but if you’re looking for other things to do you can check out the 18th century Cape Henry Lighthouse, see several beautiful state parks and wildlife refuges, spend some time kayaking or fishing, have fun in a 19-acre water park, go golfing at any of the eight public courses in Virginia Beach, and visit the unique Mount Trashmore Park, a recreational park built on top of an old landfill. Learn more about the pet-friendly properties available from Sandbridge Realty by clicking on “Rentals” and choosing “Pets” from the list of amenities.